You know that feeling you get when you find something in your pocket that you weren’t expecting? A dollar, a piece of candy, your house keys? Well we feel like that when we find more of our favorite brand and are finally able to bring it back to you, our favorite customers. We recently found more Mulberribush stock, and we were so excited we just had to get it online right away. Mulberribush is a fun and brightly colored fashion line designed to keep boys whimsical, stylish, and above all else, comfortable. Thanks to mom inspiration it has done exactly that for many long years. It is always a favorite of customers for its whimsical designs that are reminiscent of nursery rhymes and storybooks. Young boys especially love their pieces. We are always glad to have more in stock, and we know you are too. Check out some of the items currently available. Boy’s Little Monster Raglan Tee by Mulberribush: This fun tee is perfect for any little monster. Available now in 2T-4T. 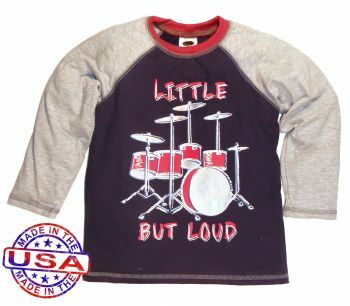 Boys’ Little but Loud Shirt by Mulberribush: Little but loud seems to describe almost every little boy we have ever met. So this shirt is not just cute, but apropos. Available in 2T-4T. 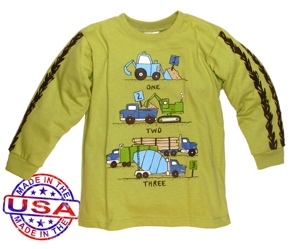 Boys’ One Two Three Trucks Shirt by Mulberribush: Trucks, trucks, trucks. Any more questions? Available in 2T-7. Because what boy doesn’t enjoy a good truck? 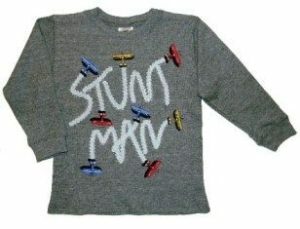 Stunt Man Shirt by Mulberribush: This shirt taps in to the dream of flying, performing stunts, and being all around free. After all, that is the way of most boys. Available in 2T-6. This entry was posted in boys clothing, Brand News and tagged boys, boys clothing, boys online clothing, boys shirts, boys store, in stock, Mulberribush, t-shirts, tees, the boys store on February 19, 2017 by Lacy. Winter is in full force! Why not enjoy the winter wonderland with some fun winter themed looks this season. Appaman, City Threads, Wes and Willy, and Mulberribush have some fun winter wonderland shirts for the winter season. Your boys will love wearing these fun and goofy winter themed shirts all season long. Hurry in now before the weather changes its mind! 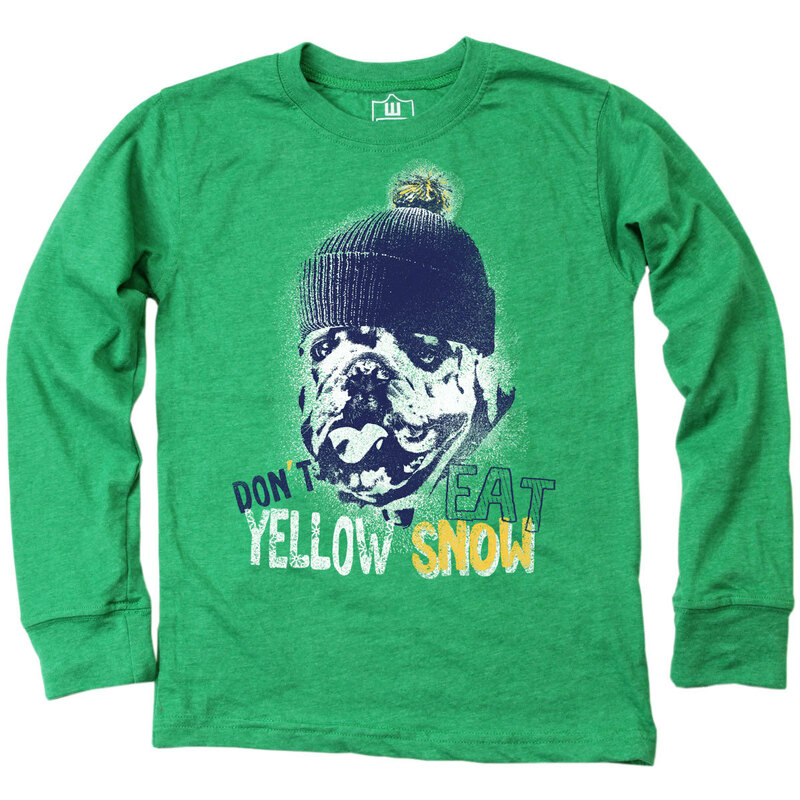 Wes and Willy Boys Yellow Snow Tee: This outrageous long-sleeved green tee features a fun bulldog in a winter beanie quoting the oft-said tip, “Don’t Eat Yellow Snow!” Boys will appreciate this fun and humorous tee, and will enjoy sharing this tip with all of their friends! 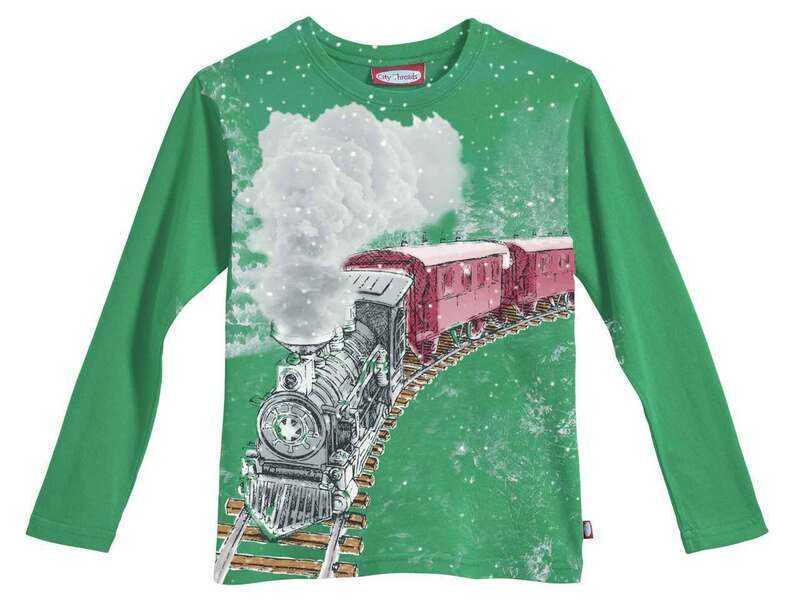 City Threads Boys Snowy Train Tee: This long-sleeved free tee features a scenic snow scene with a train engine charging down the tracks. This fun and scenic tee will be perfect for winter. Train lovers will adore this tee and any boy will love the winter scene. Snowman Instructions Shirt by Mulberribush: Because it has been so long since we last saw snow we might just need a refresher course in snowmen building. 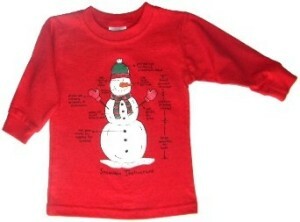 This fun instructive tee gives us all the knowledge we will need to create the world’s greatest snowman this winter. 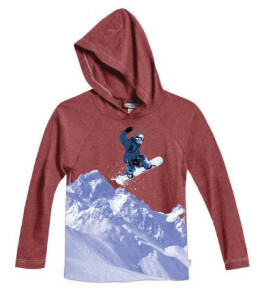 City Threads Hooded Snowboard Shirt: This hooded long-sleeved tee features a snowboarder getting some incredible air on his day at the slopes. Snowboard lovers will love this tee, but its hooded style makes it a favorite as well. Boys will love to sport this all winter long. This entry was posted in boys clothing and tagged boys clothes, cit threads, Clothes, Mulberribush, the boys store, Wes and Willy on December 21, 2015 by Lacy. School is getting started and that means that fall and winter weather will soon be on its way. So it is time to stock up on some incredibly cool new looks for the cool weather. Mulberribush has some awesome new looks that will keep your boys cool and comfy all season long. From twofer tees to hoodies style is apparent. Mulberribush knows how to keep your boys happy when it comes to looks, and we can keep you happy by offering these incredible looks straight from the source. What else could you possibly love about Mulberribush? Do the words made in the USA mean anything to you? 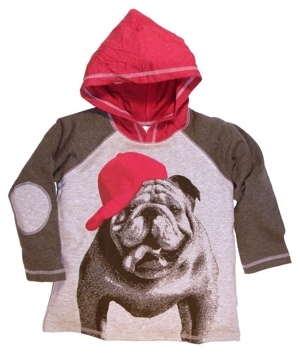 Mulberribush Boys Bulldog hoodie: this adorable long sleeved hoodie tee is charcoal, grey, and red. It features a bulldog print that will wow and impress young boys, and it is warm and comfortable which impresses mom and dad too. Mulberribush Boys Train Twofer: this long sleeve heather grey tee features a train screenprint with a train track map background. 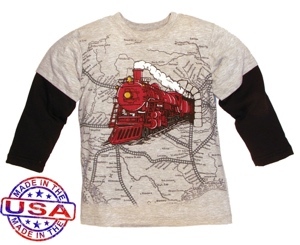 If your little man is a train enthusiast he will definitely love this tee. It features fun train routes that will impress any train enthusiast. Mulberribush Boys Little But Loud Shirt: this grey and blue raglan tee features every parents worst nightmare, a drum set. Our kids may be little, but they can be loud all on their own. Adding a drum set just ups the ante. But, they are so adorable learning to play, and the look pf pride when they finally master their first song takes some of the hurt away from the pounding eardrums. If you have a little drummer boy check out this tee for fall, it will be a smash! Mulberribush Boys One Two Three Trucks Shirt: this long sleeved green tee features three things boys love. Trucks, trucks, and trucks. Trucks in triplicate is the way to many young boys hearts. This tee is fun, bright, and will impress all truck loving boys with its different truck types. Choosing just one of the new Mulberribush tees will probably be your greatest challenge. 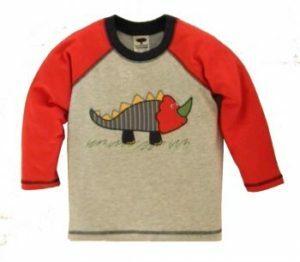 This entry was posted in boys clothing, Brand News and tagged boys clothes, Boys clothes online, boys clothes store, boys clothing, Boys T-Shirts, boys tees, boys tops, boys tshirts, long sleeve tee, Mulberribush, the boys store on August 16, 2015 by Lacy.